JBJ95, Winner of the FAN N STAR Rising Star Award! 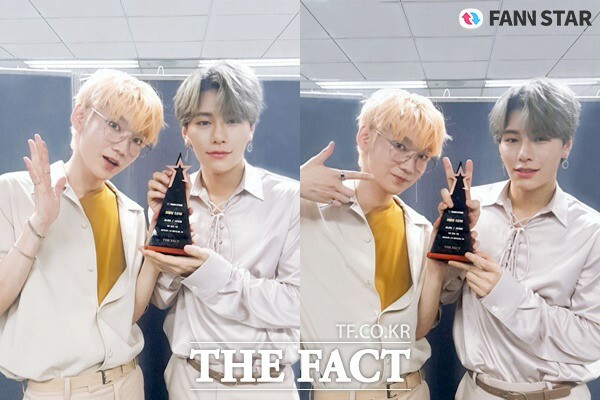 [The Fact] FAN N STAR has released a video of male duo JBJ95 winning the Rising Star award. A website that delivers information on idol rankings FAN N STAR, released photos and videos of JBJ95's "FANRAS" award at the same time on 5. In the released photo, JBJ95 is smiling brightly, holding a trophy. They also thanked to their Fan club for giving him the award. First, Kenta said, "It's all thanks to the our Fan Club. I really appreciate it," sent his message to his fans. And Sang gyun said "Since this award was given by our fan club, I think we can show you better activities in the future, I'd appreciate it if you loved our second mini album, AWAKE." The JBJ95 previously topped the "FANRAS" vote, which ran from Jan. 14 to Feb. 18, for the fifth consecutive week. "FANRAS" which is 100 percent fan voting, will receive special gifts such as exposure to news of the award on Korea, China and Japan's The Fact sites, screening of video clips of a large waiting room at 43 stations (excluding some) on Seoul's Subway Line 2 and awarding trophies. The JBJ95 Trophy certificate video can be viewed from the electronic display board of subway line No. 2 for a week from 9 to 15. JBJ95 was nominated for the U+5G DerFact Music Awards "FANRAS," which began on 1st. It is currently in second place, and if it wins the vote, it will receive a direct award at the awards ceremony.